The American Heart Association recommends 30 minutes of moderate activity five times per week for adults. But where do you start? These five simple tips will help you hit 150 minutes of activity before you know it. to squeeze in a quick workout. Next time you’re sitting down for your favorite sitcom, stretch or do a few jumping jacks, pushups or an ab workout. Try doing one exercise for the length of a commercial break, and then change it up with a new exercise on the next one. Get your heart rate up with this workout designed for quick commercial breaks. Go for a walk while you’re on the phone. It’s hard to get much else done while we catch up with friends or family on the phone, not to mention multitasking isn’t always the best solution, so why not go for a walk? Walking from room to room while at home or taking a stroll around your neighborhood during a phone conversation is an easy way to add activity to your busy week. Take the stairs and park further away. Most of us have set this as a goal for ourselves at some point — but it isn’t always easy to stick to. So, if you have to compromise to get moving, take the closer parking spot when you’re running late or if it’s raining, but take the stairs when you get inside. Adding a few steps in your daily routine can make a big difference in your energy level and mood. Sign up for a recreational sports league. out local leagues – like these in Colorado – for everything from bowling or volleyball to dodgeball. 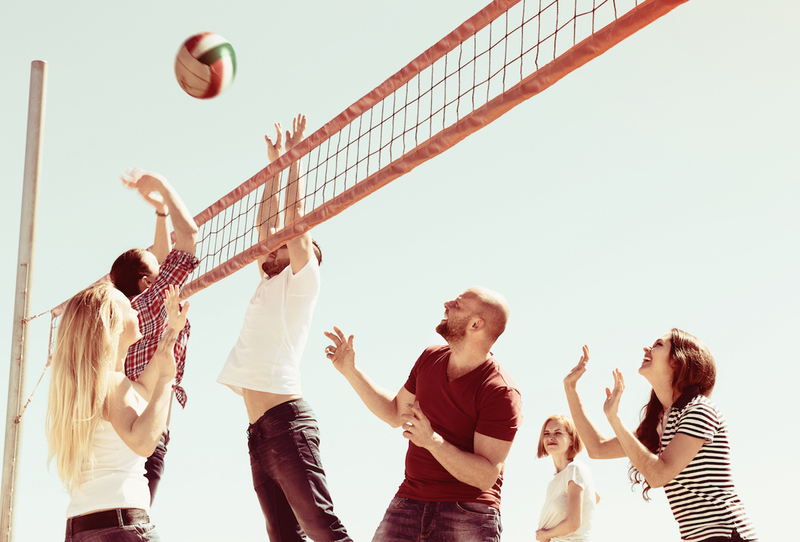 If team sports aren’t your cup of tea, you can always sign up for individual lessons. Either option gets you moving! Summer is a wonderful time to explore the outdoors. Rent a bike for an afternoon ride around a new neighborhood or grab a friend for a long walk in your favorite park. In Colorado, we’re lucky to have the mountains in our backyard. Joining a hiking or running club is a great way to commit to spending more time outside. Even during the colder months, activities abound in the Centennial State. If hiking or walking is your summer pastime, grab a pair of snowshoes and hit the trails in the snow. And remember, getting outside doesn’t have to feel like a burden — taking a stroll around the block after dinner is a great, easy way to get outside each day. Being more active in your daily life not only benefits you physically, but also mentally. Strengthen those muscles and reap these mental rewards of exercise: sharper memory and thinking, higher self-esteem, better sleep, more energy and strong resilience. Bright On! Learn about Bowman’s philosophy of “restorative exercise” by embracing the body’s movements prior to the modern living routine. There are a variety of teams and activities at your fingertips. If something traditional isn’t what you are after, you can explore skee-ball or bocce ball. Trying a new activity is can be more fun with a friend or group. CMC is organized by groups across the state and offers skill building schools and social activities for every experience level.